When the Microsoft Surface Pro 4 first came out, editors of tech sites have been sizing it up and comparing Surface Pro 4 with iPad Pro, iPad Air (2) or MacBook Air. It must be admitted that Surface Pro 4, as a 2-in-1 windows 10 tablet with best balance of size and power, is an ideal device for watching movie videos on the go, without regard to its price. To buy or not to buy SP4, you can refer to users' comments. Here we'll share with you 5 best ways to freely watch HD movies on Surface Pro 4/3/2, with filling you in on Surface Pro 4 specs first. Microsoft Surface Pro 4, featuring 12.3-inch PixelSense touchscreen and running Windows 10, values from $899.00 for 128GB/Intel Core m3/4GB RAM to $1,799.00 for 256GB/Intel Core i7/16GB RAM. There are two other storage versions, 512GB and 1TB. With display resolution up to 2736 x 1824 (267 ppi) and 9 hours of video playback, playing HD movie videos on Surface Pro 4 would be a great source of delight. But how to watch free movies on Surface Pro 4/3/2? Are there any free movie downloader software/apps for Surface Pro 4? Notice: 1 year free upgrade from Windows 7/8 to Windows 10 expired on July 29, 2016. If you missed this free upgrade chance, you need to pay $119.99 for Windows 10 Home or $199.99 for Windows 10 Pro to experience the latest Windows operation system. The first thing that maybe springs to your mind is movie downloader software, which should be completely free, compatible with Windows 10 and supportive of a wide range of online video sites. WinX YouTube Downloader happens to be one of the best free online video downloaders, capable of downloading 4K/HD videos from over 300 sites, incl. YouTube, Facebook, DailyMotion, Vimeo, etc. Better still, it's 100% free and clean. Well, watching movies free on Surface Pro 4 also can be realized by using online video download sites, such as KeepVid. Take download YouTube videos to Surface Pro 4 with movie downloader software as an example. Click the following "Free Download" button, save the .exe file safely on Local Disk besides C, and open the movie downloader after the download and setup. Go to youtube.com, search the movie title and copy the video link. 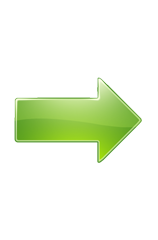 Then click "+" button of the software, "Paste & Analyze" the URL, choose your preferred video resolution, format, size and codec, and press OK button to move on. Set a "Target Folder" and tap button "RUN". And you will be able to free watch YouTube movies on Surface Pro 4 minutes later. To watch movies free on Surface Pro 4, downloading movie torrents is used to be a popular way. However, many torrent sites now are facing shutdown of the service or "not working" time and time again, such as The Pirate Bay. Well, we've noted down every step needed to download movie torrents for Surface Pro 4 so that you can have a try. Step 1: Find a torrent site that is still running and search for your desired movie torrent. Step 2: Download a torrent client if you do not have one. Normal downloader software and downloader imbedded in web browser cannot deal with it. Step 3: Do remember to pick the movie torrent with highest rating and most comments, which help you save a lot of trouble on downloading speed, quality and safety. Step 4: Click "Download" button on the torrent site and start to free download torrent movie to your Surface Pro 4. Considering the limitation of supported format of the Windows 10 tablet, you may need a HD video converter for Surface Pro 4. How to Rip DVD Movies to Surface Pro 4/3/2? WinX DVD Ripper Platinum – Rip and backup any copy-protected DVD movies to MP4, H.264, WMV, AVI, etc for freely watching on Surface Pro 4/3/2 Windows 10 tablet. DVD backup tool is the key to ripping DVD for watching movies on Surface Pro 4. If you've already installed one, jump directly to the next ripping steps. If not, download WinX DVD Ripper Platinum firstly and I'll tell you why. Most movie DVDs are copy protected and hard to be backed up due to copyright issues, for example, kids' favorite Disney animation DVD movies. 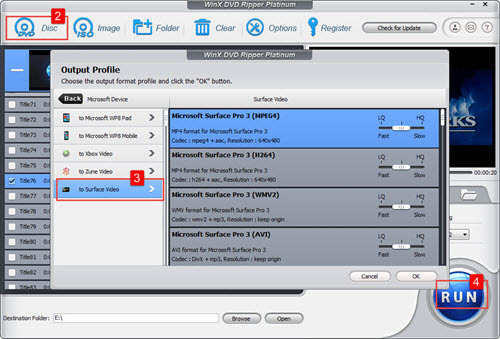 Common DVD rippers can't detect the right title from up to 99 ones and maybe crash while WinX DVD Ripper Platinum deals with Disney X-project DRM perfectly, as well as Sony ArccOS, DVD CSS, region code, etc. What's even more amazing is the fast DVD ripping speed, together with unparallel output video quality. Well, the developer only advocates ripping DVD movies to Surface Pro 4 for personal use and suggests referring to the related DVD copyright laws before doing so. Click the "Try It Free" button to download and installed this Windows 10 DVD ripper. Insert the source DVD into hard drive -> click "DVD Disc" button -> select the DVD disc -> OK -> wait for the loading. Choose "Microsoft Device" from the pop-up window, and then go to "to Surface Video", following by select "Microsoft Surface Pro 4 MPEG4/H264" (the profile is to be added soon). Step 4: RUN the DVD Ripping for later watching movies on Surface Pro 4. 1. Go to www.microsofrstore.com -> click Entertainment -> choose Movies & TV from the drop-down menu. 2. Hundreds of movies and TV shows are available at a certain price for watching on your Surface Pro 4. Let's say you're going to play Inside Out. 3. Choose the version you want: watching HD video on Surface Pro 4 needs $19.99, SD $14.99. The rental version will be much cheaper. 4. Click the button "Get it now" and you will be directed to the sign-in page. 5. Do the payment and then enjoy watching movies on your Surface Pro 4. The most recommended two are PopcornTime and Netflix. One is sort of the best free movie apps for Windows (Surface Pro 4/3/2), Mac, iOS, Android and Linux, however not available in Windows Store. The other has been long well-received by people and offers abundant TV shows and films. * Enable video editions, e.g. add SRT subtitles, trim/crop videos, set video/audio parameters to best fit Windows 10 tablets.